Update March 2018: I have done more work on this recipe and settled on proportions I like even better. This one still works just fine, but if you’d like the new version you can find it, and lots of other recipes, in my cookbook: Tried and True Historical Recipes for Home, Camp, and Feast Hall. 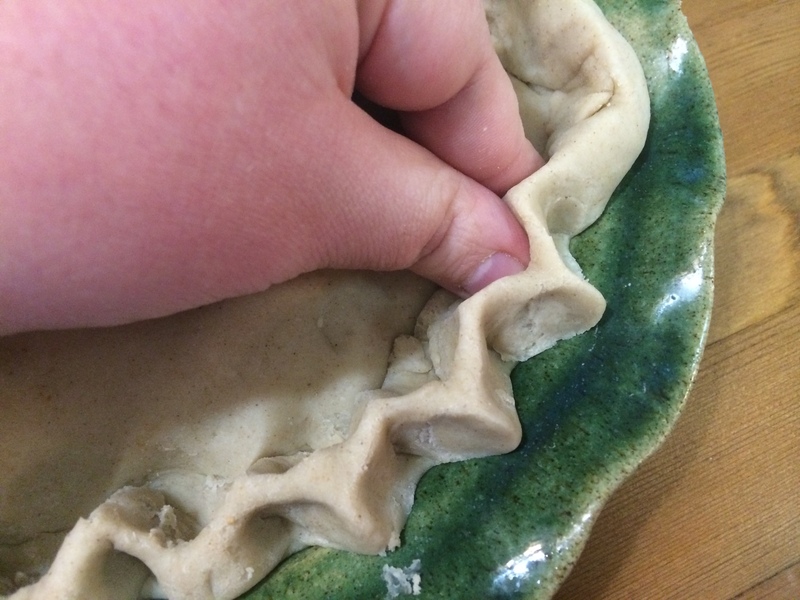 After several years of experimentation, I have developed a method for making hot water pastry that works very well both for rolled crusts and for self-supporting crusts for a wide variety of medieval pies and tarts. I use imported flour from Lammas Fayre for my pastry and have been extraordinarily happy with it. I recommend their Elizabethan Manchet Blend for this recipe as that most closely matches the evidence I found for what type of flour was used by high medieval English bakers. If you are unable to obtain this flour, you can substitute a mixture of 2 parts whole wheat pastry flour and 1 part unbleached all purpose white flour, although this does not have the same qualities as the heirloom wheat varieties or sieving to yield “white” flour. This recipe uses lard for fat, so it is only suitable for meat day pies. That said, lard crusts needn’t be exclusive to meat-filled pies — I’ve never had a problem with the taste of lard pastry for sweet pies. For the record, I use leaf lard from heirloom Tamworth hogs, but you can substitute any home-rendered or pure rendered lard. Do NOT substitute shelf stable lard from the grocery store, it is substantially different from natural, real lard. If you are cooking for a meat day but cannot use lard due to dietary restrictions, rendered beef suet is a fine substitute but has a somewhat stronger flavor. For fish or fast day pies, the evidence I have found suggests that their pastry was made with thick almond milk, but I am not currently satisfied with the pie crusts I have made using this method and plan to do more experimentation before “officially” publishing a recipe. The historical pie dish I have is much smaller than a modern pie dish. The amount of pastry that I need to line and top that dish is also a good amount to make for a self-supporting pie that isn’t too large. With some experimentation, I found that doubling the quantities I used made enough pastry for a two-crust pie made in a standard modern pie dish. Since I suspect this is more useful to more people, those are the quantities I give here. Thanks for successfully doing the research on medeival pie-crust for us! I’ve searched for ages to find how they made whole-wheat pastry but couldn’t find anything. We have a guy on island who raises bison so that’s my source for buying tallow (lard)(lief-lard). I buy sacks of wheat and grind it fresh myself ( I’m not going to be buying special flour). I always buy heritage, hard red-fife wheat…would that work ? or does it have to be soft wheat ? And does it HAVE to be/do you think it should be SIFTED to make nice pastry ? I’m thinking more of pastry for meat-pie/shepherd’s pie. I’m VERY happy to have finally found someone to talk to about this subject. Hello and well met 🙂 What great questions! I have used red fife for pastry — while soft wheat is ideal for pastry, hard wheat will work (but make a tougher finished product). Check out the “files” section for my full notes on grains and flours of medieval England — although the evidence I found so far has not risky ruled out the possibility of medieval people having access to hard wheat, overall I concluded that soft wheat (and low gluten wheat varieties like rivet wheat) was more readily available historically. Oh, and on sifting — that’s an interesting question because it brings in some medieval economics. Short answer: you don’t have to sift the flour to get a functional pastry, but wheat flour was typically sifted. Longer answer! This answer applies to high medieval England specifically. Wheat was harder to grow than other grains. For low-status / cheap food, like pies sold in urban cook shops, the flour used was probably maslin (wheat and rye mixed) or maybe other combinations of cheaper flours (rye, barley, oats, etc). These weren’t necessarily sifted / bolted. If you could afford all wheat flour for your pastry, you could afford to have someone bolt it to remove the bran. I also think wheat bran was used by bakers the way we use semolina and maize flour now, to keep loaves from sticking. That’s purely conjecture, though.